We’ve all seen the new wave of police/detective procedural programmes coming out of America over the last couple of decades or so, the CSIs, the NCISs, the Law & Orders and the Criminal Minds. The ones where tireless and relentless detectives, armed with the latest in forensics hardware and software, persuade the silent dead to speak and to point the finger of accusation. Reviver, the debut novel from Seth Patrick, takes this idea one step further: the dead do in fact speak and finger the perpetrators themselves. Let me just say here that crime and thriller fiction aren’t within my normal reading parameters, although those crime series mentioned in the opening paragraph have all been in my radar at one time or another. In other words, this review is based entirely on a personal reading of this book, based on nothing more than a subjective but self-contained reaction to the story. It helps, of course (for this old horrorhead, at least), that a series of fantastical paranormal elements form the backbone of the plot, elements that add spice to a story that, it has to be said, is fairly straightforward. 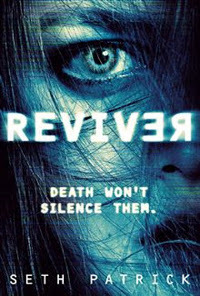 In that sense, there isn’t anything new here to shout about, apart from the macabre side-story involving the revivers. There were too many inconsistencies in the book for me to thoroughly enjoy the book. It certainly isn’t a bad book by any means: the story itself is decent enough, perfectly adequately written and paced. By the same token, it’s flawed in ways that perhaps a more experienced writer would have avoided. The explication at the beginning felt too prosaic, and the flat retelling of first this happened, then that, leading to the inevitable conclusion, was just too pat and, maybe, felt a little hurried in a kind of ‘let’s get this quickly out of the way’ manner. On top of that too many peculiarly British idioms turn up in what is ostensibly a story firmly based in the US. Never Geary, a technician and one of Jonah’s closest friends, uses the word mate (as in “I’m fine, mate”) and shag, which jarred me out of the flow on a regular basis. Nowhere was it mentioned that Geary was a British ex-pat, which would have explained the use of such a specifically alien idiom. Additionally, I felt that the whole could have had a much firmer editorial hand applied to it. The rhythmic peaks and troughs that comprise any kind of book felt almost forced here, as if the slower portions were afterthoughts slotted in to conform to a rigid formula. Even allowing for a debut novel, I thought that much of the first third could have had a sizeable amount of text excised without affecting the story itself. Furthermore, although we guess from the start that the strands involving Jonah and Annabel will converge and intertwine it takes quite a while to get there (practically halfway through). There is obviously meant to be some sort of sexual friction between the two when they do meet, which partly explains the reappearance of Tess Neil, a woman the orphan Jonah met at Baseline when he was seventeen and lusted after without it ever being reciprocated, at his superior’s retirement party. The problem is that her return ultimately feels irrelevant and unnecessary, not really adding anything to the story – presumably then it is included as a means to bring closure to the episode in his younger days as well as some titillation. Over and above that, Tess showing up when she does seems too convenient and contrived. This convenience happens on quite a few occasions – things needed to progress the story just seem to fall into Jonah and Annabel’s hands at precisely the right moment, plus Annabel’s habit of acquiring sensitive information just seems too good to be true (even though she’s a journalist with connections). Her ‘hacker guy in London’ seems too handy an excuse not to have to go into too much detail about her sources. If I’m honest, the narrative doesn’t ring true, as if the characters are merely acting out a carefully-scripted play. I don’t like being negative about someone’s work, especially when it comes to sitting down to write a book and finishing it. Looking at it from the point of being an editor, however, I just felt that a lot more could have been done to bring it under control and to help shape it into something less contrived. There’s the core of a great story here, but I think the meeting of the two main characters could have happened sooner, a lot of the back-story could have been cut out or condensed into fewer pages: the flow was interrupted too many times. Plus a little less of events happening almost magically at the very instant they were needed would have gone a little way into making it more believable. The central conceit, that of the revivers and the act of revival itself (as well as its potentially deleterious side effects), is something that, ignoring everything else I have said above, is well-handled and described. There is a particularly gruesome scene during Jonah’s revival of the decomposed body of Daniel Harker, which will truly make the squeamish squirm with its graphic description. What does come across well is the fact that, although revival has been enormously helpful in securing justice for those who are unable to speak for themselves, it’s a thoroughly unpleasant way of getting the necessary information. Certainly, as one gets further into the book, one wonders why people would even consider a career as a reviver. Patrick definitely has potential: he can turn a fine phrase and his descriptive prowess is more than adequate. In my humble estimation, I think he just needs a better editor to take him in hand and work on cutting out unnecessary verbiage which isn’t needed. There’s a story desperately crying to get out here, but it’s drowned by an excess of words. Saying that, I would be interested to see where Patrick goes from here and how he develops as a writer.